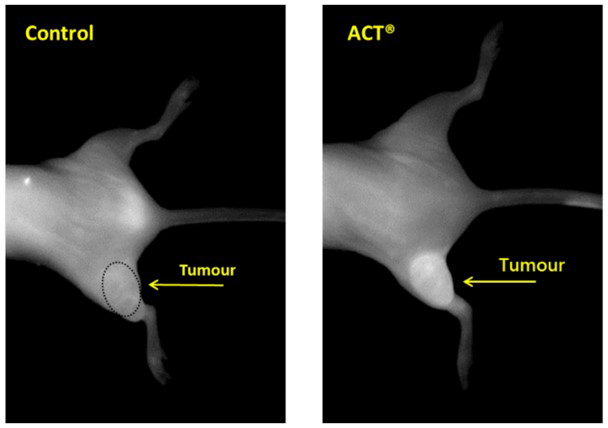 According to Phoenix Solutions, this image shows the increase in tumor-specific uptake with ACT® treatment and localized ultrasound insonation, meaning that more of the drug is getting to the tumor. Phoenix Solutions was founded in 2012 by three scientists from GE Healthcare (formerly Nycomed Imaging), Per Sontum, Andrew Healey, and Svein Kvåle. They developed a concept for targeted delivery of medicine with the help of microbubbles and ultrasound. The trio has long years of experience in diagnostics and cancer therapeutics from their time at Nycomed Imaging, Amersham Health, and GE Healthcare. All are inventors with patents. The startup is one of the companies in the Oslo Cancer Cluster that is operating close by Radiumhospitalet, the city’s cancer hospital. The founders own the largest part of the startup. The main goal is to provide clinical proof-of-concept for their Acoustic Cluster Therapy (ACT®) technology. According to the Oslo Cancer Cluster, this will enable the startup to push on with their task to fight pancreatic cancer and meet a key developmental milestone. Together with partners at the Institute of Cancer Research/Royal Marsden Hospital (United Kingdom) and Haukeland University Hospital (Bergen), Phoenix believes that ACT® can make a significant difference for patients with this hard to treat, deadly disease. Typically, the efficiency of a variety of drugs to treat cancer are limited by the dosages because of the toxic side effects. Less than 0.01 percent of the injection actually reaches the tumor and treatment is discontinued because of the excessive toxicity, not because the patient is cured. Enabling a targeted delivery process ensures more of the medicine reaches the tumor, increasing efficacy, reducing side effects. The ACT® product, which includes microbubbles, is injected intravenously, along with an infusion of a chemotherapeutic agent. The treatment process occurs as the bubbles are exposed to an ultrasound at the specific tumor area. In clinical trials on mice, from 2 to 300 percent more of the medicine reached the tumor and median survival rates for prostate and breast cancers drastically increased, with more than half fully cured. At the end of 2016, Phoenix Solutions completed a financing round led by a small group of healthcare angel investors. So far, they have received NOK 30 million in grants from the Norwegian Research Council. Last year, they received NOK 12 million in financing from investors. Oslo Cancer Cluster is a non-profit member organization with close to 100 members, including companies, research and financial institutions, university hospitals, and organizations working in the cancer field. About 30 of the members are located in the incubator in the Oslo Cancer Cluster Park. They share the park with Ullern Upper Secondary School, the Cancer Registry, and Oslo University Hospital. In December, the company was awarded a $60,000 grant from Innovation Norway through Oslo Cancer Cluster’s Oncology Innovation Call 2017 for development and validation of a clinical platform for ACT®. They will cooperate on the project with Humanscan Co. Ltd. and Translational Genomics Research Institute based in Arizona. The latter is a world-leading institute for development of novel therapeutic regimes for treatment of pancreatic cancer. In January, Phoenix signed an agreement with GE Healthcare to supply the ACT® drug product for the upcoming clinical trials. They are excited to get GE on board as contract manufacturer of the product. GE’s Oslo organization is the world-leading site for the manufacturing of this class of pharmaceuticals. Clinical trials will start later this year. This article originally appeared in the June 29, 2018, issue of The Norwegian American. To subscribe, visit SUBSCRIBE or call us at (206) 784-4617.